Thanks so much for stopping by today! I’m excited to share with you the new kinder kiddo in town – – KinderWordBuilding! Now my husband did not agree with the name but I thought it had a little jingle to it 🙂 KinderWordBuilding is a 20 week literacy intervention program! There are actually 15 built in assessment days so the program is 115 academic days! 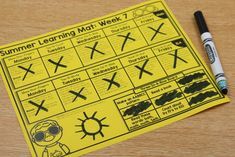 The natural school year is longer that that I know… However, with intervention groups those usually start a little later in the year! 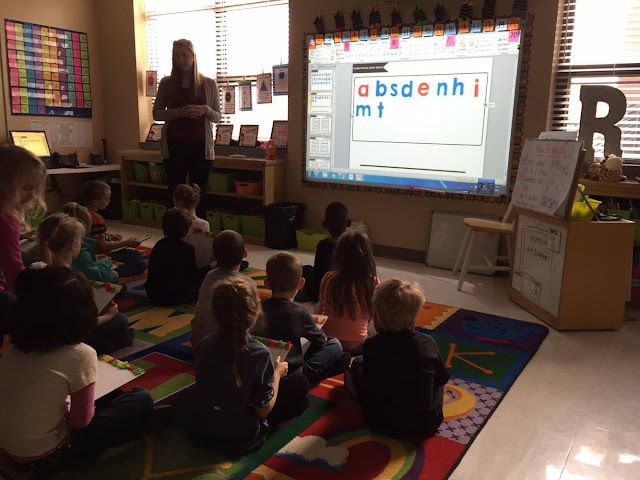 The program makes its way through short vowels, mixed short vowels, digraphs, mixed digraphs, double ending consonants, long vowels, and mixed long vowels! Below is a look at the pacing of KinderWordBuilding! implementation and varying student levels. like a whiteboard or magnetic cookie sheet. read fluency cards, teacher wraps up lesson. unless necessary for time constraints. Now let’s take a closer look at KinderWordBuilding! Below you can see what’s including in the unit! You’ll get 20 explicit weeks of lesson plans. There are also include fluency cards that match the words students will be building and writing. For building reading fluency you will have the option to use the “let’s build reading fluency” interactive slides, blackline fluency sentences, or easy readers! Included in the unit is also the student journal blacklines and high frequency cards! Alright, let’s run down the “day to day” of KinderWordBuilding! Here is a snippet of the building and writing portion of the lesson! 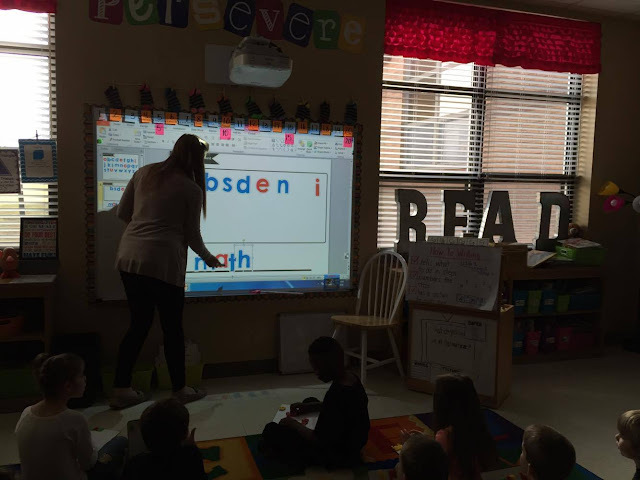 Students have their letters already on their boards so they are ready to build! 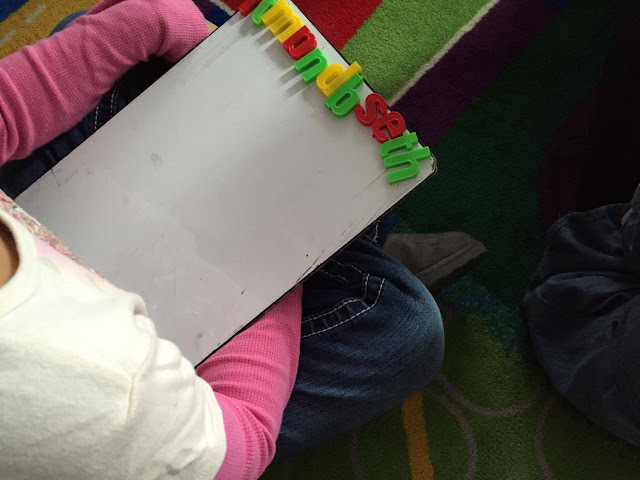 Students will pull down the letters to build their words and then push them back up after each word. Below you can see the use of the interactive file within the units! These will work on any interactive whiteboard! They are made in powerpoint and the letters are able to be moved around! 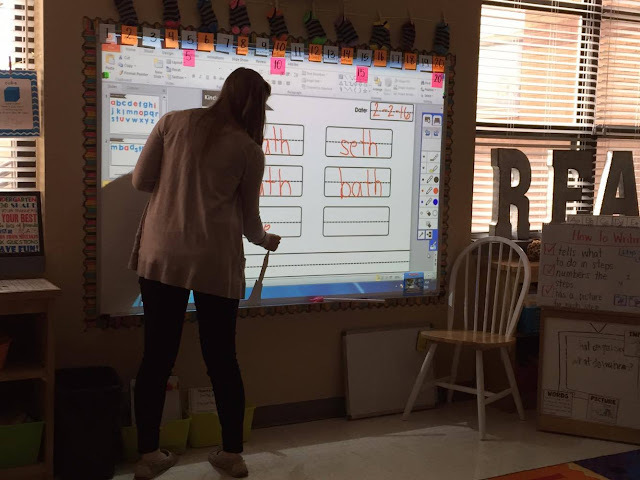 After the students have written the word the teacher will also write the word on their board for students to self-check. 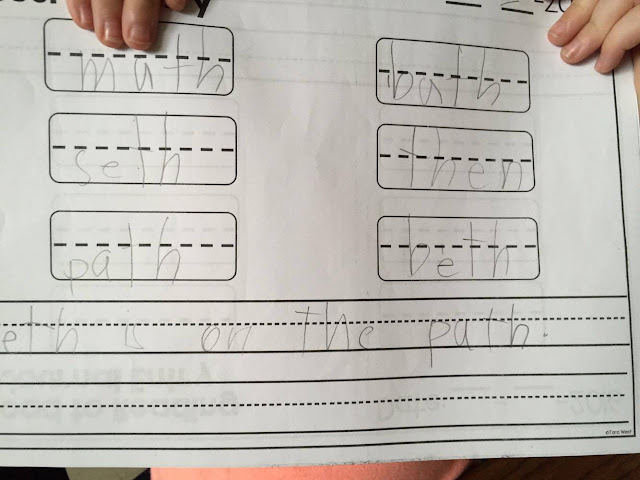 You can also draw attention at this time students properly utilizing the handwriting lines! Students are able to easily write their words after practice through building words! STEP THREE: Students will build reading fluency! Within the packet you have a few choices between the fluency whiteboard slides, fluency blackline sentences, and easy readers! STEP FOUR: Students will build sight reading fluency! There are included word cards that the students have covered in the lessons and high frequency cards! The following are options if you have an interactive whiteboard! 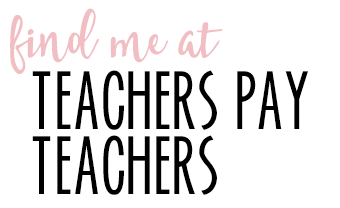 I’ve included a teacher set of magnetic letters and a whiteboard version of the journal paper! 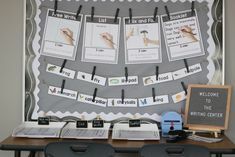 This will allow you to model building the words and writing as the kids build and write their own! Now let’s talk about organizing your KinderWordBuilding material! I have placed mine into a three ring binder! I will be able to turn to the lesson page I’m teaching and have it right there at my finger tips! I like to keep my plans in a sheet protector so that I can easily see them and then place them back into the binder after that week! Assessment in KinderWordBuilding! The assessment piece is completely optional as yes I agree we do a lot of assessing! However, it’s quick and painless! Within the unit I’ve provided a list of words you will use for each assessment and students will simply take the assessment in their journals! I’ve included an assessment tracker so you can see how the kiddos are progressing through the levels! I’m super proud of KinderWordBuilding and have used the program in my classroom for four years! You can try out a free week of KinderWordBuilding HERE. KinderWordBuilding is now a big kid because there is another new kid in town- – Firstievention! I knew a first grade version would be necessary for my firstie teachers AND for those of us with advanced kindergarten kiddos! Firstievention runs just as smooth as the kindergarten version! The only difference between the two is the skill focuses covered! Below you can see the scope and sequence including all of the skill focuses covered in the firstie edition! Firstievention includes all of the same goodies as the kindergarten version minus one small difference! In the first grade version I removed easy readers and added the one page fluency skill builders! 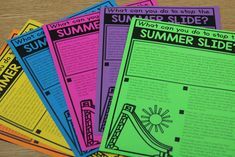 For these the kiddos will read through the words three times to build that continuous fluency! 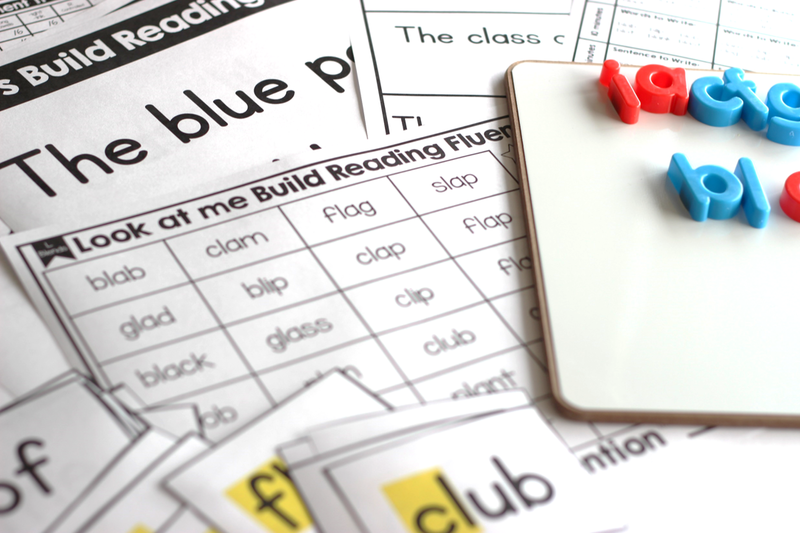 Below you can see the three versions of fluency building included the new “Look at my Build Reading Fluency” sheets! The Firstievention also includes fluency word cards in two versions and high frequency words! Firstievention follows the same pacing routines as the kindergarten version! 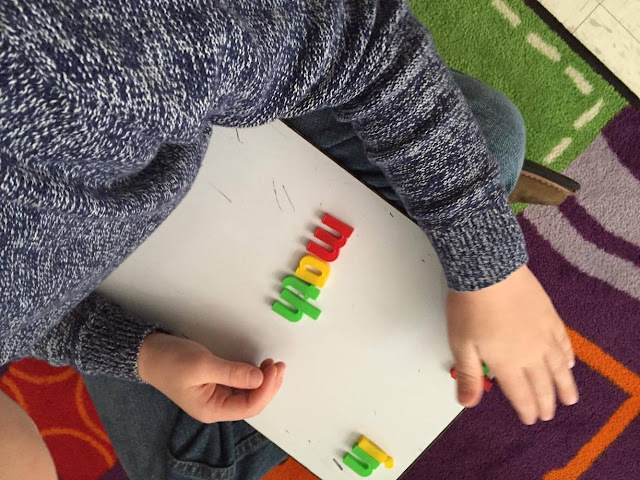 The students will build the words from the lessons using magnetic letters! Firstievention includes an all new assessment tracker as well! If interested in Firstievention you can click below to read more about the packet! 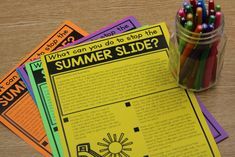 Kindergarten Curriculum + Freebies and Videos! I'm interested in this for working with low firsties. Is there a version of the journal that doesn't say Kinder on it? Or do you have something that is geared more toward low first? Thanks. I adore all of your products (I own lots!!!). OH never thought about that! I will get both versions added now! Great idea! THANK YOU!!!! You are honestly THE BEST! You are in the trenches using these materials and sharing your genius with the rest of us. I think that's why they are so good–because you use them! The packaged products are created by people not working in schools. THANKS SO MUCH for all you do! Hi Tara, I work with students k-2 in a remedial reading room. I have been working on letter identification and letter sound with my kindergartens. They are ready to move forward. This looks the perfect next step. Thank you! Just so I am clear on this intervention, is it research based? I am thinking no, but I just want clarification. Thank you- it looks like it could be great reteaching material for those needy students. Tara – I you amaze me. 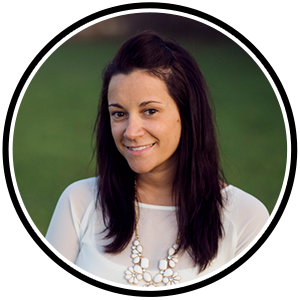 I love your products and the number one reason – they are so useful and user-friendly!! I hate to ask (you are so busy making stuff already), but, maybe for this summer you could consider making a Kindervention MATH. 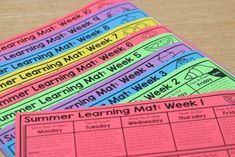 Something like this, set up we could do ourselves or give to paras – easy to put in a binder and track. Just a thought. Hi Tara, my question is, do you do this everyday? Does this take place of your phonics and you do it whole group and small group? This packet is not part of your guided reading mega bundle is it? Just trying to figure out how to fit this into my schedule it looks great! Hi there! We have a built in 30 minute intervention scheduled into our day! That is in addition to guided reading and phonics time! And this packet is not part of the guided reading bundle! Let me know if I can help with anything! So is this just for lower ability kids or all levels? Thanks for all your help! You are amazing ! Ok can you give me a little more detail on how you organized it please! 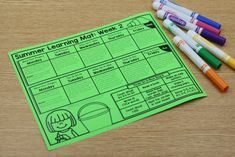 I see how you put the lessons into a binder but what about additional resources? I like to be told specifically how you do it and then tweak it…plus my brain is so tired right now that I can't think! 🙂 Thanks!! Hi Tara, I'm wondering how you manage the magnetic letters, getting them out, etc.? You said that you have a built in intervention time where you use KinderVention. That is AWESOME!!!! I am curious as to what your schedule looks like for one day. I am curious how you fit things in and how you have found it best to arrange your day. Thanks in advance! (I have your Guided Reading Mega Bundle, Kinder Math , Kinder Phonics and KinderVention. I want to "redo" things next year, so I am curious how it all fits.) THANKS!!!! How do you organize their daily writing journal? In a folder, binder, or?? What research is this program based on?